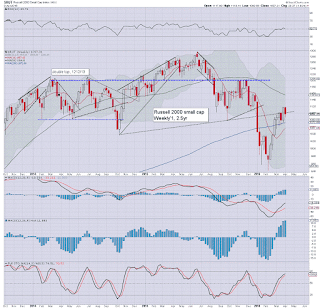 US equity indexes continue to build a series of marginally lower highs from the summer 2015 highs. 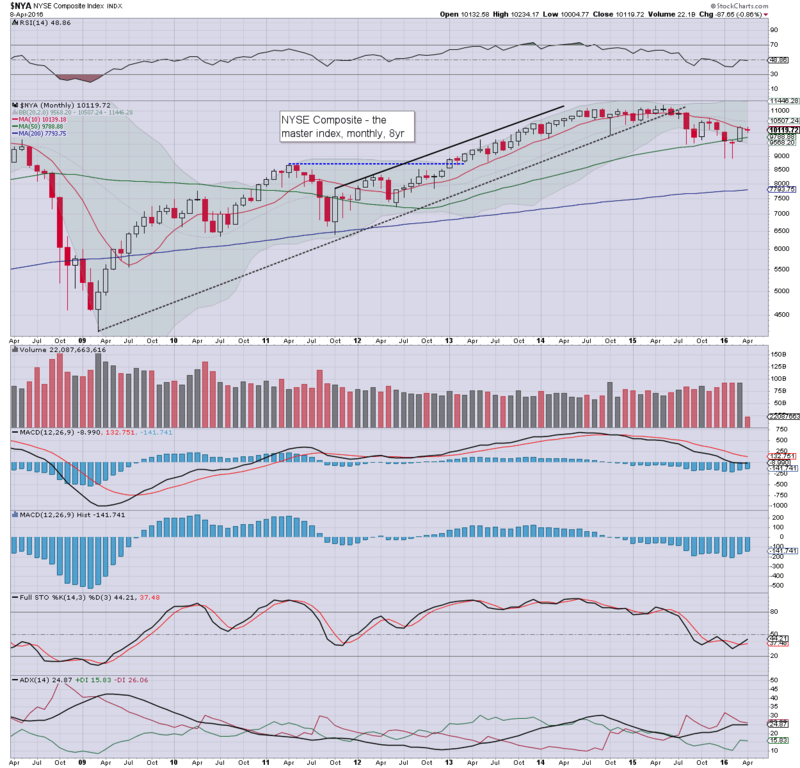 Unless the equity bull maniacs can push above the Nov' high of sp'2116 - equiv' to Dow 17977, there will be high probability of renewed severe downside to the sp'1600/1500s this summer. 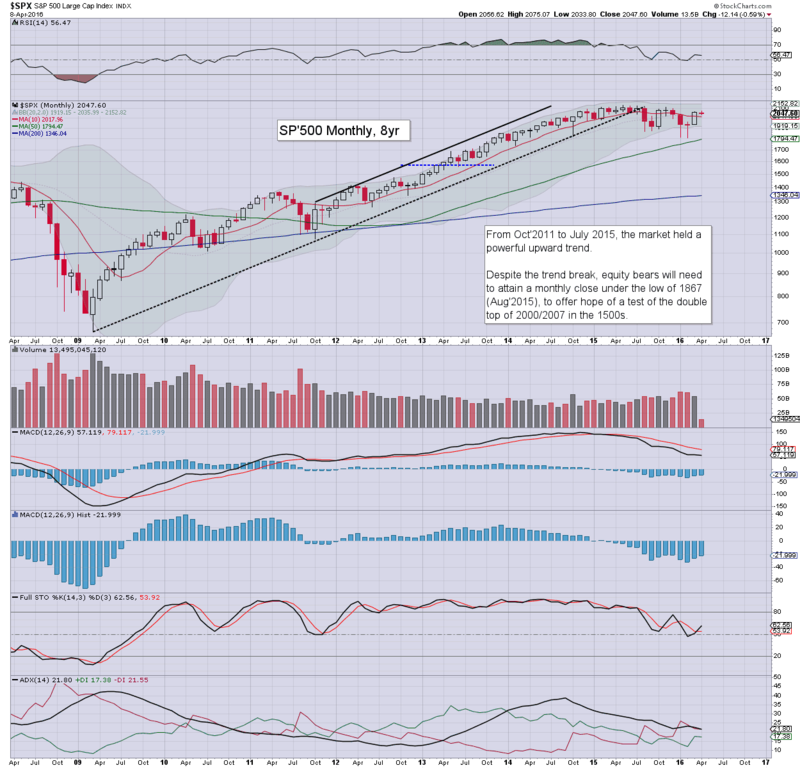 Even a cursory look at the giant sp'500 monthly chart should make it clear just how stuck the US equity market has become since late 2014. Most notable of all is that we have a critically important series of 'marginally lower highs', starting from May'2015 @ 2134, followed by 2132, 2116, 2104, 2081, and the April 1st' high of 2075. Unless the bull maniacs can start taking out the series of lower highs, the bears will have another opportunity to whack the market lower in the months ahead. 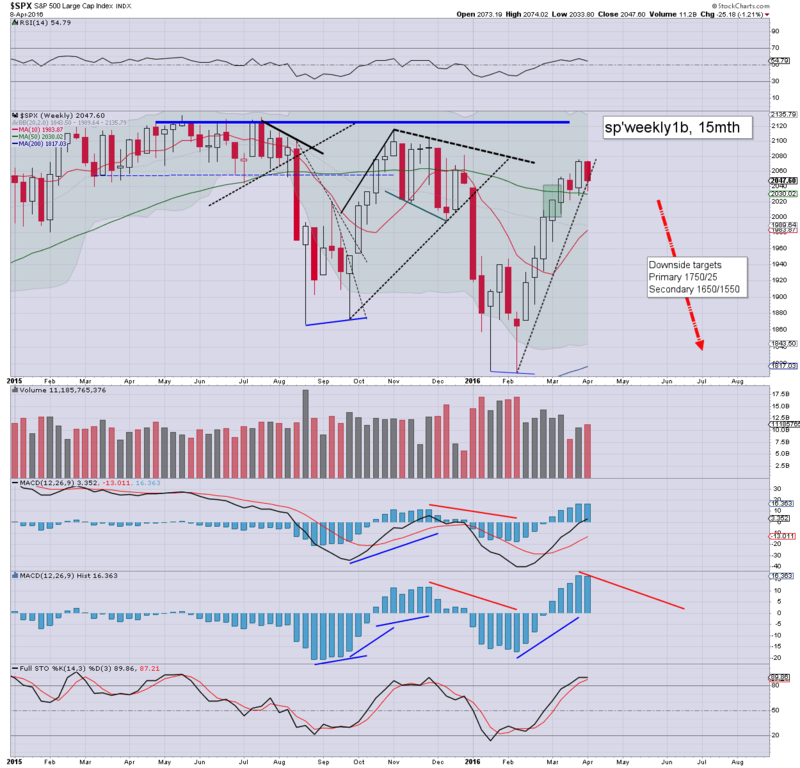 Best guess: another 2-3 weeks of chop within the sp'2050/1980 zone.. before a serious break lower in late April/early May. 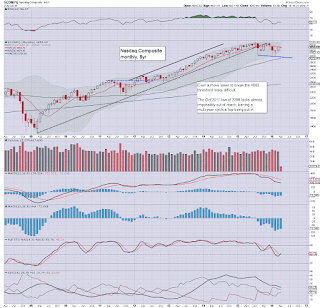 The first opportunity for a break under the Feb'11th low of 1810 looks viable no earlier than mid May. 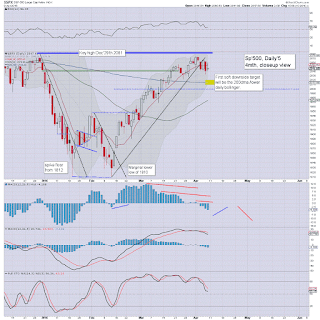 The most viable time for a 'crash move' to the sp'1700/1600s will be June. 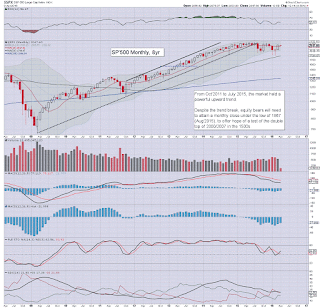 The Nasdaq remains stuck around the monthly 10MA, and appears extremely unlikely to see any price action above the giant psy' level of 5K. 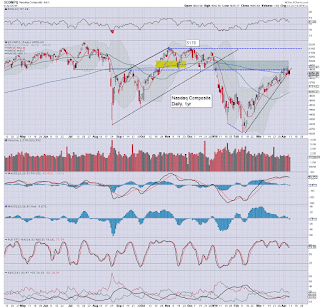 Key support in May will be in the 4100s. Any break <4K would open the door to the 3200/2800 zone. The mighty Dow settled the week at 17576. Key resistance is the Nov'2015 high of 17977. Unless the equity bulls can break >18k, the bears remain in control, and will have high probability of being able to drive the market back under 17K in May. First key downside target is the Aug' low of 15370. If that is broken, then a crashy move to the 14200/000 zone, if not the 13000/12500s will be due. 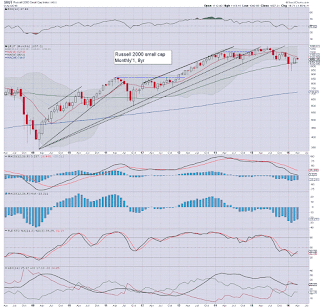 The master index remains unable to clear the monthly 10MA. Renewed downside <10K looks probable, with first soft target of the 9500s. The 8K threshold would be a natural 'crashy' target this summer. 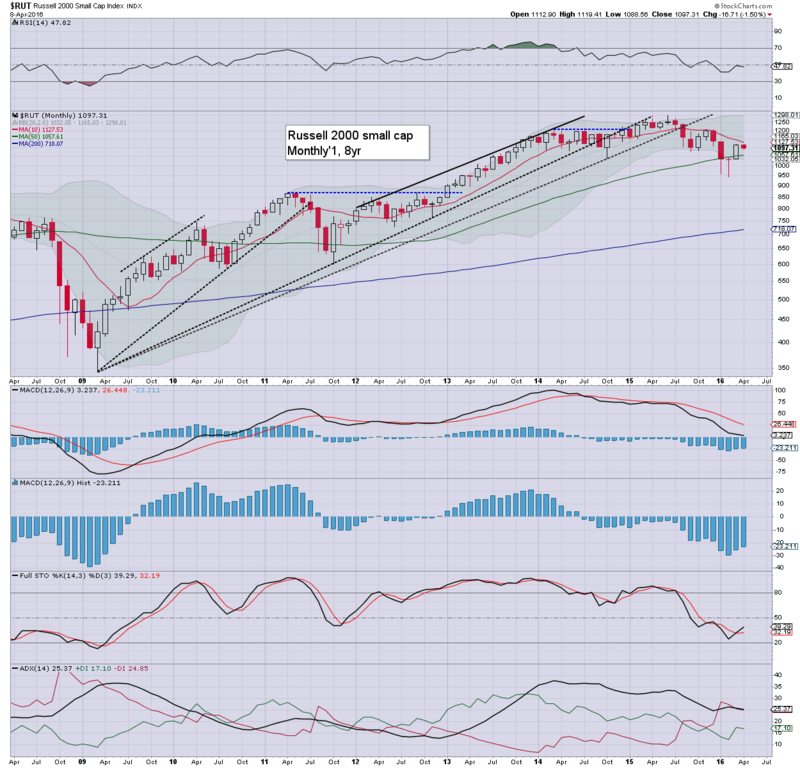 The second market leader - R2K, also remains stuck under the 10MA. A break under the 1K threshold will open the door for major downside to the 875/850 zone. 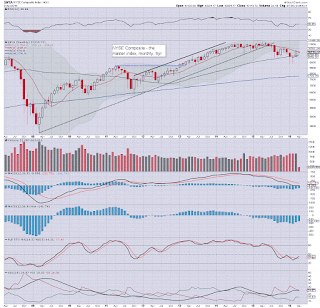 Right now, the most bearish case looks to be around 750, but that is a long... long way down. The 'old leader' - Trans, is starting to look vulnerable again, settling lower for a third consecutive week, after a powerful nine week rally. 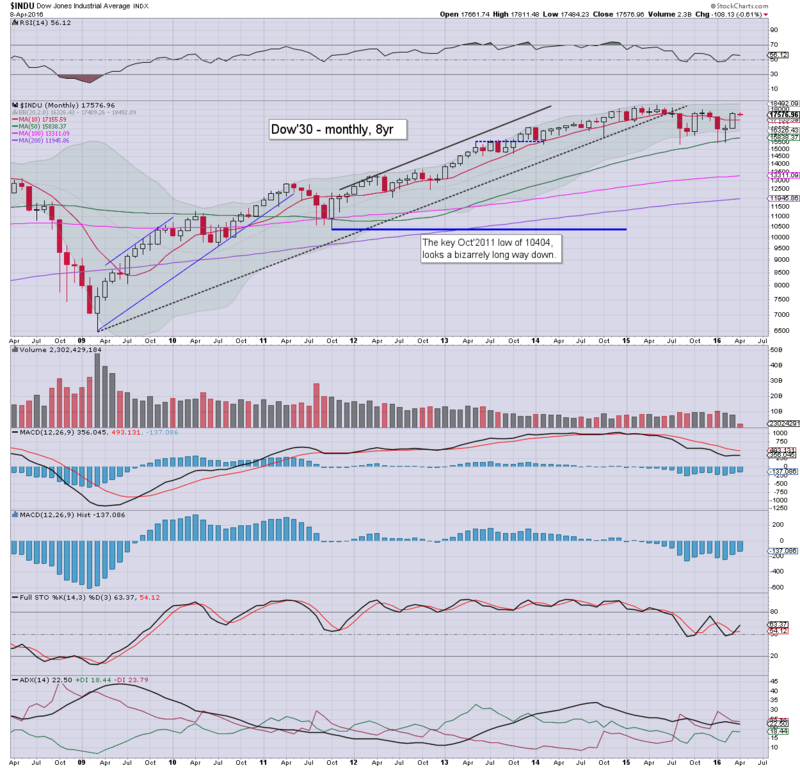 The monthly 10MA remains core resistance in the 7700s. Any price action <7500 will open the window to summer downside to the 6000/5500 zone. 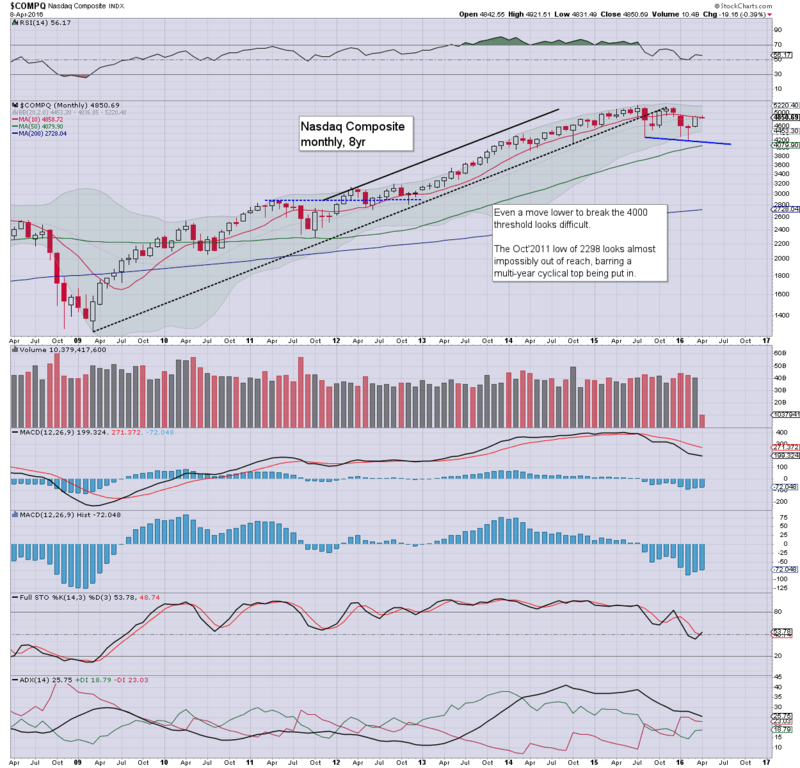 We have a clear split, with the headline indexes - sp'500, Dow, and Nasdaq, holding relatively close to historic highs, against the NYSE comp', R2K, and Trans', all of which are holding within broad downward trends from late 2014/early 2015. 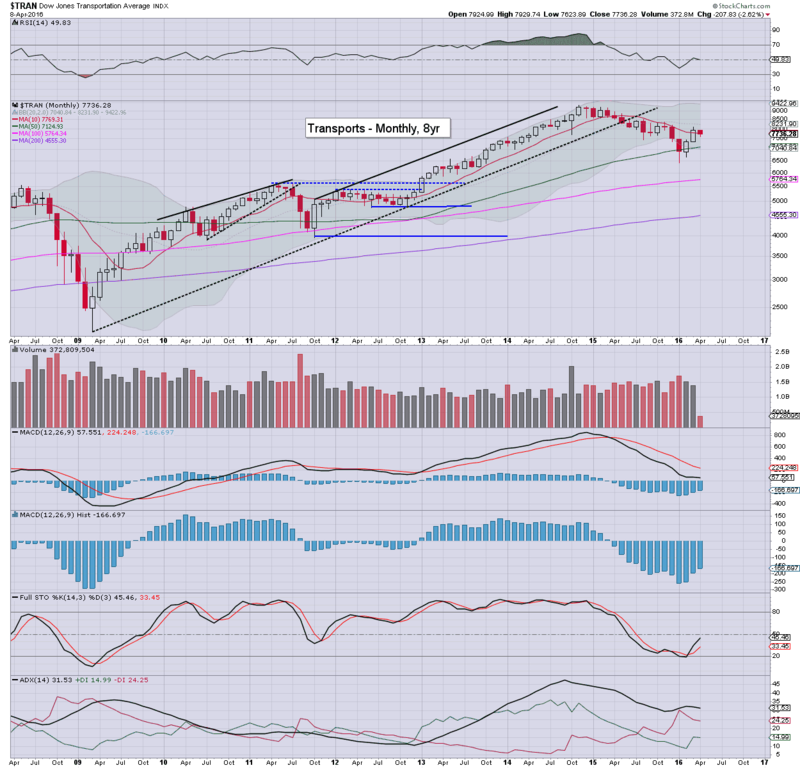 The Trans/R2K are the two leaders of course.. so it can be argued this is to be expected. The NYSE comp' is an exceptionally broad index, and is a more representative measure of the 'real market' than the sp'500/Dow/Nasdaq. 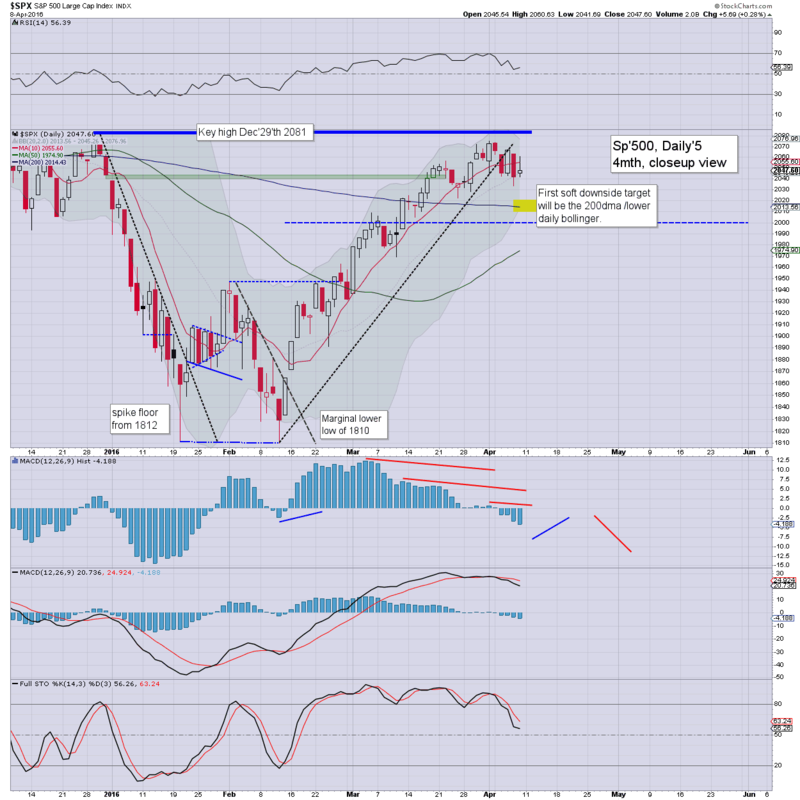 The equity bull maniacs face a damn tough challenge, as they are again failing to push any higher, with recent price action merely resulting in yet another marginally lower high of sp'2075. Clearly though, the equity bears will need some 'spooky news/data', to help initiate a major new multi-month wave lower.. breaking below the Jan/Feb' lows. Oil - the over-supply issue has not been remotely resolved. A move back under $30 looks inevitable. 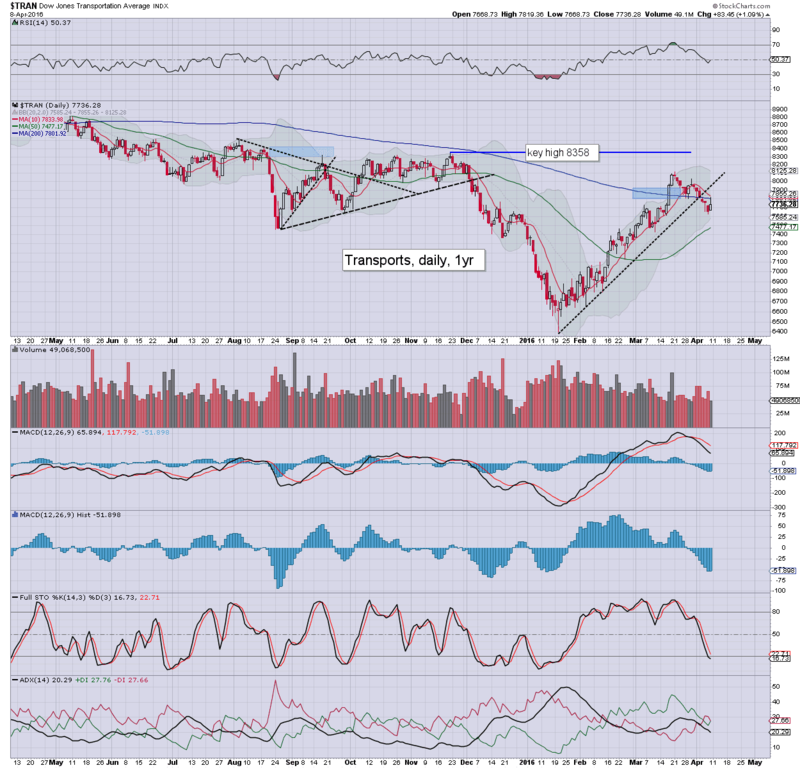 Capitulation within the energy industry would likely require at least a brief foray for WTIC into the teens. USD - despite recent weakness to the DXY 94s, the USD remains king of FIAT world. 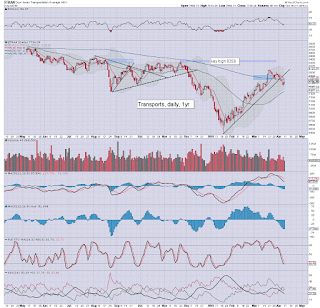 Renewed upside to the 100 threshold looks a given, and eventually to the 120s - as the Euro and Yen will broadly weaken. A stronger USD will put a downward pressure on all $ denominated asset classes, especially Oil and equities. The precious metals might be able to escape the USD downward pressure via a sustained 'fear-bid'. Economic - without question, the world economy is having increasing recessionary and deflationary issues, not least in terms of weak world trade. US Q1 GDP (due April 28'th) might print close to flat.. perhaps even fractionally negative. Earnings - US earnings are under pressure, with quarterly declines set to be the worse since spring 2009. Further, the USD is relatively close to the DXY 100 threshold, and that remains a major problem to the internatioanl corporate giants (esp' most of the Dow components). BREXIT - a UK vote to exit the EU would have a great many implications, not least as it would inspire other EU states to also initiate votes. A complete unravelling of the EU would cause massive upset to world capital markets, and the shock waves would likely ripple for many months. 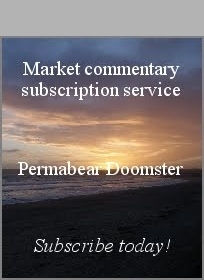 Seasonal - the US - and most other world markets will be particularly vulnerable across the May-August period. M - US Fed to hold a 'closed meeting'. *there is a light sprinkling of Fed officials across next week. 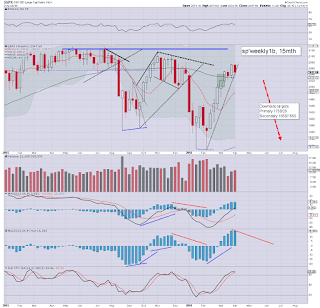 It was a very choppy week for US equities, but broadly.. leaning on the downside. 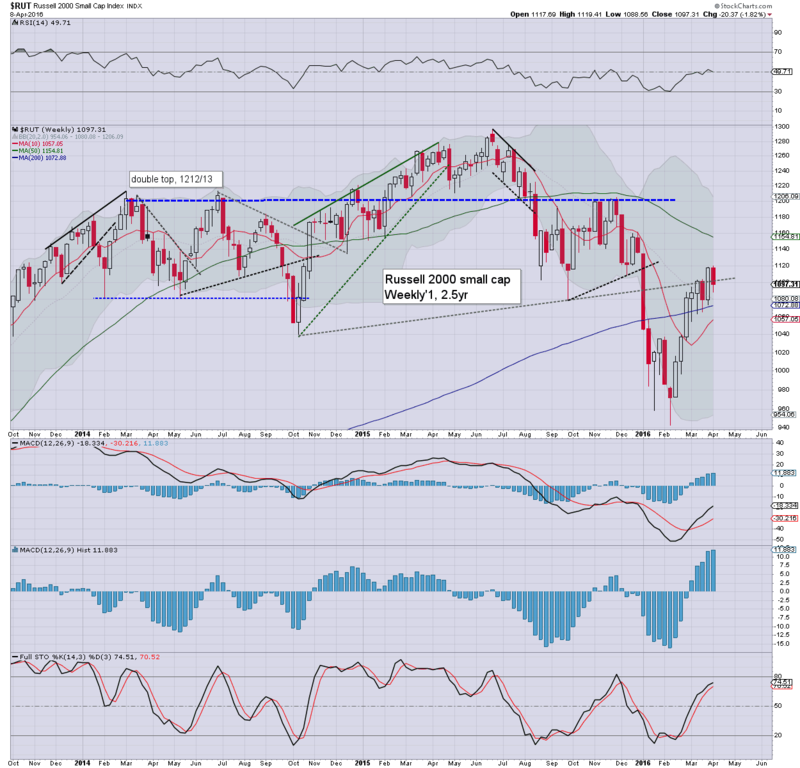 The sp'500 saw a net weekly decline of -25pts (1.2%) @ 2047 (intra low 2033). The second market leader - R2K, saw a net decline of -1.8% @ 1097. 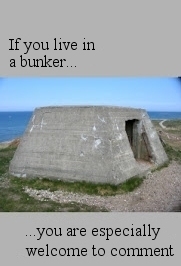 .. and that will suffice for this week. 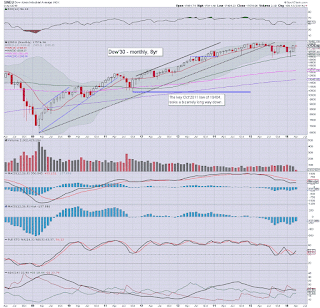 sp'500: a failed rally, with a spiky candle, closing under the 10MA. Underlying MACD (blue bar histogram) is now on the low side. At best, equity bears might see another 2-3 days of downside before yet another bounce. Nasdaq: a black-fail candle, settling under the 200dma. Further downside of 2% looks well within range next Mon/Tuesday. 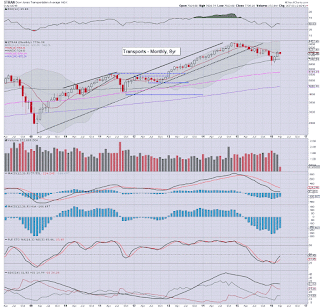 Trans: a somewhat spiky candle, unable to hold the 200dma. 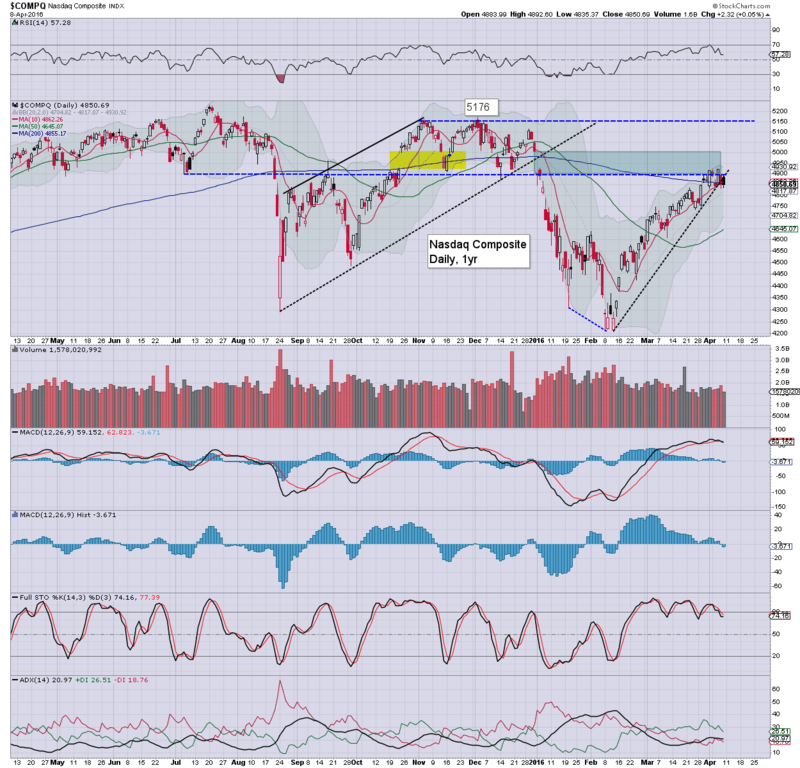 Renewed downside would be to the 7500 threshold.